One of the many things that fascinate me about African football is that totally unknown players can emerge from basically nowhere and establish themselves at top sides in a matter of short time. Talented striker Uriah Asante of Hearts of Oak SC from Accra is a great example of such a player. The hard facts about Asante are that he currently has played nine matches in the GLO Premier League, scoring two goals – against BA Stars in Round 5 and against Wa All Stars FC in Round 8, the latter a beautiful bicycle-kick. Two days ago, Asante lead the Hearts-attack against main rivals Asante Kotoko FC in Kumasi, resulting in Hearts winning 1-0. Many thought Asante was “Man of the match”, perhaps together with goalkeeper Sammy Adjei. 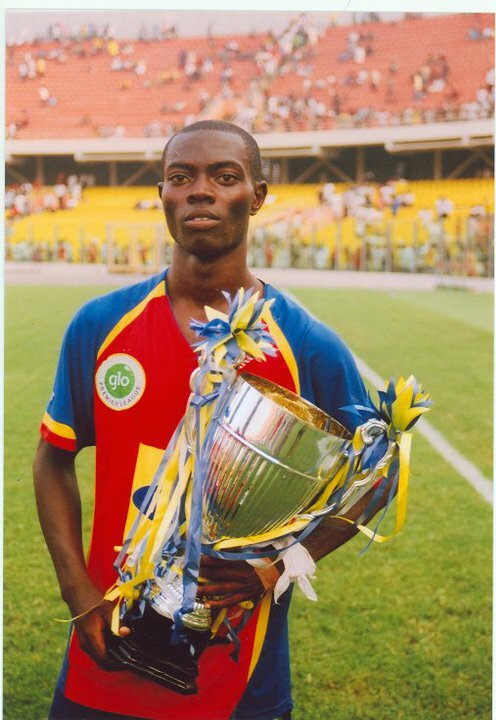 Asante was actually preferred ahead of the much-hyped striker Edwin Osei Pele, who had to start at the bench. Uriah Asante is born 06.03.1992 which makes him 18 years old. He is apparently 174 centimeters and about 75 kilos. Asante is a product of the so-called feeder’s team of Hearts of Oak SC, called Auroras FC. Last season, 2009-2010, he apparently played for Pure Joy Stars FC – a team from Prampram in the Greater Accra area. He was included in the first-team of Hearts of Oak SC this summer and played a couple of matches for the team in the Top Four tournament and the SWAG tournament before the season. As far as I know, Uriah Asante has never been part of any youth international team of Ghana, neither Ghana U-17 nor Ghana U-20. This will most likely change during the following months. Asante is a skillful and pacy striker who is often playing at the left, either as the left-sided half of a striking duo, as the left-attacker in a striking trio or as a left-winger. He has the ability to take on defenders on his own and creates dangerous situations with his speed and mobility. I personally think it is a bit early to conclude that Asante will be a star, but his career has undoubtedly gotten off to a flying start. Hearts of Oak SC are apparently interested in buying new strikers and players such as Ghana U-20 prodigy Frank Acheampong (played for King Faisal Babes in 2009-2010) and former Black Stars-striker Peter Ofori-Quaye (played for AEL Limassol of Cyprus in 2009-2010) have both been mentioned. It remains uncertain if Asante manages to fight off the competition he will definitely face at some point, but it is fair to say that Asante has already became a huge favorite amongst the fans of Hearts of Oak SC. The picture is taken from http://www.mybestplay.com/players/soccer-forward-uriahasante-33090ii3.html. URIAH ASANTE keep it up and i know you are going to make it to the top.please tell uriah that i have miss him very much so therefore he should get in touch with me on this no 0261513033.uriah this is your boy franklin aka mc, way back in school @ field engineers school. hope to here from you sooon.